The direct-injected V-6 is estimated to generate 400 hp and 400 pounds-feet of torque. DETROIT -- Cadillac has promised that its forthcoming CT6 will form the tip of its technological spear, packing features such as an autonomous-drive system and a rearview mirror that streams video from a rear camera. That spirit of innovation will extend to the sedan’s powertrain, with General Motors announcing that an all-new 3.0-liter twin-turbo V-6 will be available under the CT6’s hood. The direct-injected V-6 is estimated to generate 400 hp and 400 pounds-feet of torque. 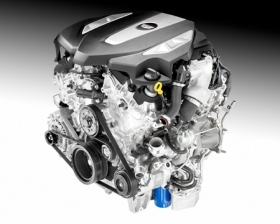 At 133 hp per liter, Cadillac claims, the new engine is one of the most power-dense engines of its type. By comparison, the same-displacement inline six-cylinder found in the BMW 7 series, which is expected to be one of the CT6’s key rivals, generates 315 hp and 330 pounds-feet of torque. Power likely won’t be the engine’s only calling card. Cadillac hasn’t released fuel economy metrics, but the presence of cylinder deactivation and stop/start functionality (a first for this type of engine) along with GM’s HydraMatic eight-speed automatic transmission -- the same gearbox found in the 2015 Escalade and Chevrolet Corvette -- suggests that efficiency was also a primary goal. The CT6 will bow March 31 at the New York auto show, and go into production at GM’s Detroit-Hamtramck assembly plant in the fourth quarter.